Unfortunately, passivity became a bit of a promblem for me: Dill was likeable, but he was a passive protagonist - the events around happened to him, not because of his actions. Yes, there are justifications, but he's just not as interesting as his fellow cast members. Rachel, on the other hand, was much more active. Sometimes wrong - well, often wrong. But a lot more fun to read. It's in the sequel, however, that things really improved. The amiable demigod John Anchor, the sea god Cospinol in his rotting sky-ship... Well, they enlivened the story. A lot. Scar Night also escalated fast, possibly too fast. You know what I'm referring to: if one minute your struggle's a personal conflict, and the next it's about the fate of the world... In Iron Angel, howver, everything is on such a scale that you just enjoy the ride. Gigantic automatons, gods, portals to hell and flying fortresses - well, just say it's a lot more interesting than Deepgate. Scar Night also had a problem with the awe factor. In other words? It wasn't there. Regardless of how dark the fantasy is, gods and entities merely rumours throughout the book should impress, and the climax came off a little lacklustre becuase they didn't. Iron Angel remedied this completely, with the introduction of the soul-based, shapeshifting Maze, shiftblades, and Arconites. This is probably the key reason for reviewing both together - because while Scar Night is decent enough, Iron Angel really makes up for its deficiencies. One thing you'll want to bear in mind, however, is that it's dark. Characters will die - or be maimed. Including your favourites. There are some fairly disturbing creations. 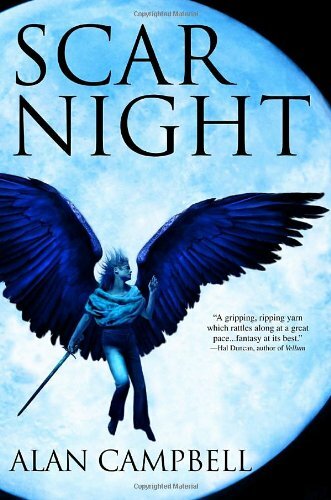 But if you're able to enjoy that for what it is, an unusual epic on the larger scale, you'll love Iron Angel - and Scar Night is a decent read as background. All in all? Iron Angel: very good. Scar Night: worth it as background to its sequel, but only decent in its own right. If you love the non-traditional, the dark, and huge clockwork monstrosities (cool factor up to 110%), then this is probably your kind of thing. If you prefer the character focus? Probably not. Ah, interesting... I thought the same about 'Scar Night' (and especially about Dill - it takes him AGES to do anything exciting! ), but perhaps it's worth me trying 'Iron Angel' to see if I get into it more. – كذلك عليك إختيار أفكار الألوان المناسبة لطلاء كل غرفة في المنزل، بما يتناسب مع الغرض المرجوّ من الغرفة. كما أنّ الإضاءة في الغرفة تلعب دوراً كبيراً في إظهار جمال الديكور، وإضفاء رونقاً خاصّاً للمنزل، مع إعطاء الضوء المناسب والمريح للعين أيضاً.